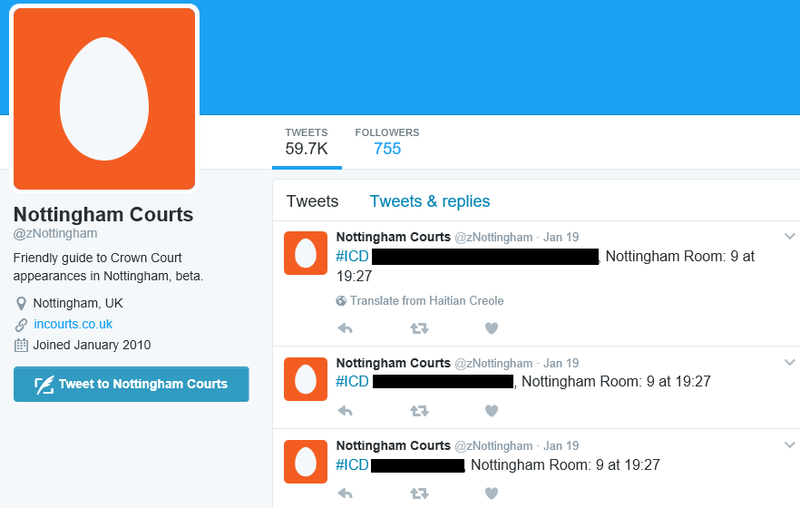 Home News Courts Ministry of Justice – Hacked? Sensitive files with the names of individuals involved in secret court proceedings are appearing on a website and Twitter feeds. Lawyers are up in arms at what appears to be a hack of Ministry of Justice data being fed directly from a website to fake social media Twitter accounts set up in the name of each local court. Some of the names include individuals involved in family court proceedings which are supposed to be kept secret. 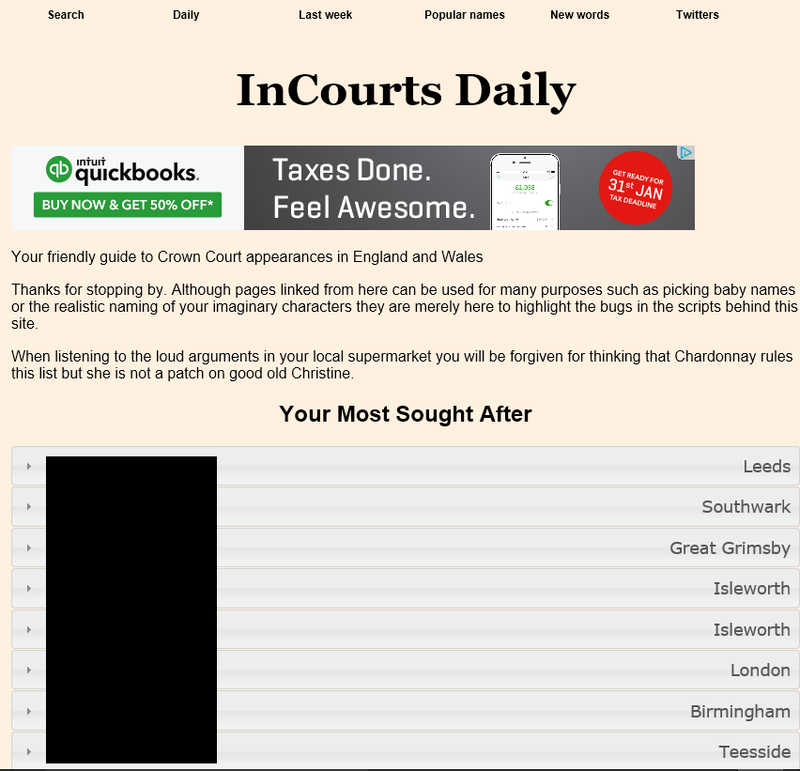 A website called ‘In Courts Daily’ refers to itself as “Your friendly guide to Crown Court appearances in England and Wales”. 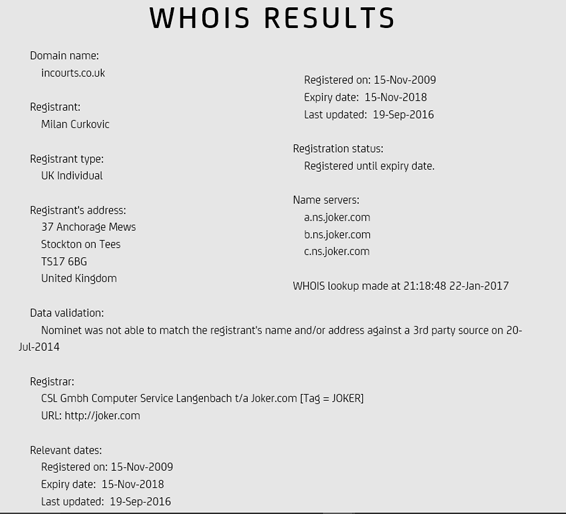 The site is listed by internet registrar Nominet as being registered to an unverified individual and is hosted by the German site: joker.com. 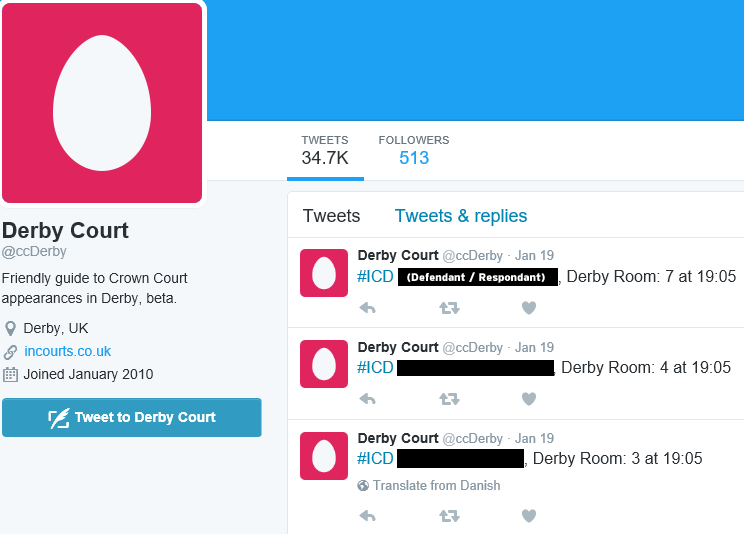 The site’s data is automatically feeding dozens of fake Twitter accounts set up in the name of individual local courts, providing detailed listings of each individual involved in the case, the time and date and the court room number. Twitter has, so far, refused to remove the accounts. We have blacked out the names of the individuals appearing on the lists but the Derbyshire Independent has discovered that some of the names are those of individuals appearing in sensitive family court cases involving children that are supposed to remain confidential. A spokesman for the Ministry of Justice was unavailable for comment at the time of publication. The Ministry of Justice publishes all family court cases @ http://www.courtserve.net The parties are names of divorce, family law (NMO / Occupancy) but not private law child, public law child and child maintenance enforcement cases. Quite right, Richard. The names of Family Law litigants in cases involving children are not supposed to be published. It remains to be seen how the website’s publisher has gained access to what appears to be a direct feed from the Ministry of Justice (MoJ). The suggestion is that access to a live MoJ database has been hacked but we do not yet know if the publication of the names of those involved in children’s cases is an ongoing MoJ error.